for the retrospective, what do you think about what we’ve been doing over the last year? What impact is our work having on the ground through local library service delivery? What have we been doing well, and what should we look to change in future? 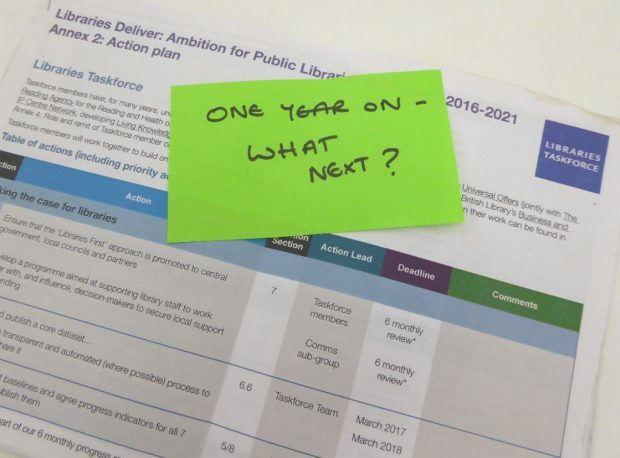 for the forward look, do you think there is anything significant in the Libraries Deliver: Ambition document that needs to be changed? And what actions do you think we should be prioritising for 2018 (these might be existing actions where we need to do more work or new actions)? We’d like to hear from as many of you as possible, whether you’re a councillor, library service manager, front line staff, volunteer, library user or partner organisation. We’ve created a short online survey, and would really appreciate any feedback you can give. The survey runs until 10:00 on Wednesday 22 November 2017. If you can’t access the survey, please email librariestaskforce@culture.gov.uk and we’ll send you a word version to fill in.